Today is confession time: this post has been in the making (or writing?) for a few months now. When after a long and busy day at the office I was walking down the hill towards the tram stop I was always drafting it in my mind. What I would tell you, and how I would say it. Then once I arrived home the evening was so short that after meal prepping for next day’s lunch, making and eating dinner I was too tired and lazy not to give in and say yes to Boyfriend when he proposed watching an episode or two of our favorite series while cuddling on the couch and unwinding from the long day. Then when I finally decided today was the day when I would put into words my rambling thoughts I ran into some technical difficulties and couldn’t access the blog for most of the day. But here we are. So take a seat, and a cup of tea/latte/hot chocolate and thank you for reading it, it will be long. And quite possibly rambly. First let’s address the elephant in the room: this is my first post since July. Why? There are several reasons behind that. 1. The main one is that in August my mom was diagnosed with a brain tumor. And it turned our world and lives upside down. It was shocking and scary to see my young, energetic and active mom, who worked out daily, went on couple hour-long hikes and ate healthy having to face endless scary doctors’ appointments, having to hear about cancer, radiation and chemotherapy, just to name a few. To tell you the truth we still aren’t over the shock yet. But the family rallied and my dad, two sisters and I put our lives pretty much on hold to spend as much time as we could with my mom. Her treatment is still ongoing and we hope for the best. But as you can imagine, it was not only lack of time that kept me from blogging but also the fact that my head and heart were elsewhere. 2. Then there is also the non-small dilemma of privacy. In real life I’m a quite private person, I don’t like to share much about my personal life with people other than my closest friends, yet I didn’t want to keep this a secret on the blog. I debated whether I should tell you about it or keep mum since you are mostly here about the recipes. But I felt that if I didn’t share about this significant part of what’s currently going on in my life, it would feel like a lie. 3. And if that wasn’t enough came the third straw: being away for so long from the blog I developed kind of like a writer’s block: the longer I was away the harder it was to “get back in the saddle” and start writing a post. You know like those awkward and mortifying scenes in movies when the character is in class/has an exam and freezes completely with that deer in the headlights stunned look and even though they know they should say something, they just can’t utter a word or a sound. Well I felt kind of like that. Only in writing (if that makes sense). But it seems (though it took me a few months) that I surmounted these obstacles, since here I am sharing with you what have kept me busy these couple of months. So I figured, if I got started, why not continue? 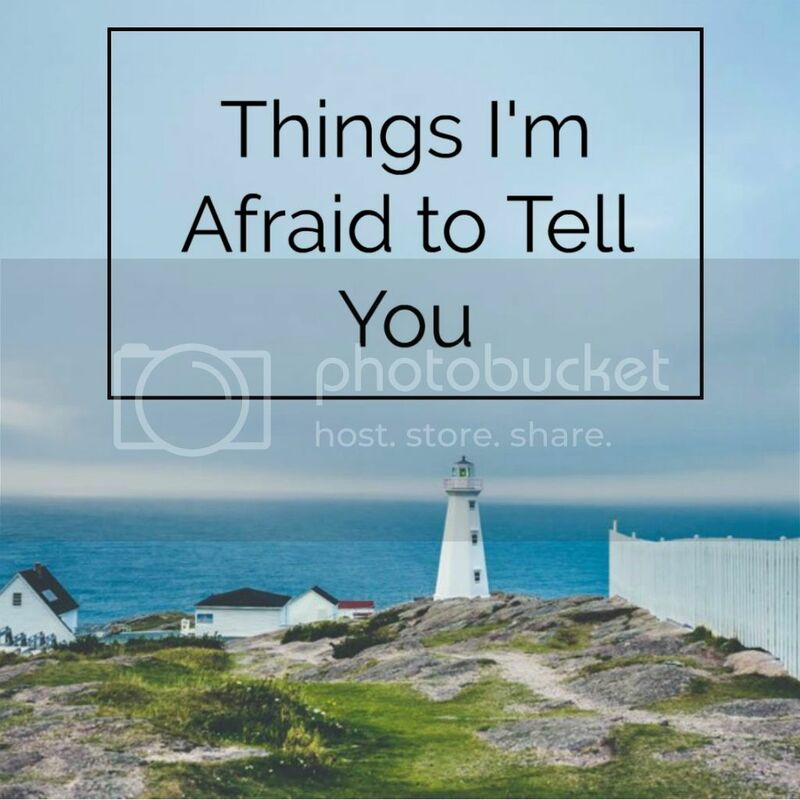 That’s why I found it fitting to share my confessions to you in this “Things I’m Afraid to Tell You” post, that was inspired by Ashley’s post on Blissful Basil. So curious to know what things I’m afraid to tell you besides the one I already mentioned above? 4. Even though I know I shouldn’t, I keep comparing myself and this blog to some other blogs, which of course makes me feel disppointed and inferior. 5. I struggle with working out. 6. I’m terrified by my inbox. I have a chronic fear of missing out syndrome: I sign up for all these great programs: adopt healthy routines, become happier, how to build your list, create courses, etc. and the e-mails just keep on piling up, while I don’t have time to read them. Currently I have about 600 unread e-mails in my inbox (1 out of the 6 e-mail addresses I have, though I only use 4 + 1 for work at my corporate job), which stresses me out immensely. That’s why for 2017 I decided to make letting go my mantra: delete all the e-mails I have no use for, unsubscribe, and let go of everything that just clutters my life and mind. It won’t happen overnight, but I hope that the fact that I want to tame the beast will overpower any lingering hoarder instinct I have. 7. I’m a perfectionist and it’s been holding me back. I have a very high standard of how I envision any work, project done, and unless I can achieve that I won’t take that step or leap forward. (Nicole Culver said it once and it was a revelation to me: that perfectionism is just another name for procrastination, and she was completely right!) I have so many ideas for the blog, for posts but get overwhelmed by all of it (whether RL tasks or all the things one should do: keep up with all the social media, photo editing, etc.) and my coping mechanism is shutting the door on the chaos and just trying to ignore/forget about it. 8. My biggest fears are disappointing people and Impostor Syndrome. we often hesitate to believe that what’s natural, maybe even easy for us, can offer any value to the world. In fact, the very act of being really good at something can lead us to discount its value. My thoughts exactly: if it’s so natural and easy for me, then it seems unbelievable that it isn’t that way for everyone. 9. I’m learning to love myself more every day. The past year I’ve started on a journey of self-discovery, establishing and exercising emotional well-being and taking care of myself. My whole life I’ve been defined by labels of “good daughter” and “good sister”, and the expectations I put on myself were becoming suffocating: I realized that I was trying to live my life according my family’s expectations, so as to make them happy, not taking into account what would make ME happy. But it’s high time I stop that. I realized that I need to take care of myself, it’s my life. 10. Although I’m excited and intrigued by all the possibilities, adventures and flexibility of the entrepreneur lifestyle, I’m also scared witless: noone in my immediate family or circle of friends is an entrepreneur, so it’s all vague and unknown to me, kind of like a scary black hole. Phew. That was a long list. Seems I had quite a lot on my heart. Thank you for reading, I’m glad I could share it. And who knows, maybe a few of these fears won’t sound so unfamiliar to you. Would you return the favor and share one thing you are afraid to tell people? I’d gladly listen to you.